The winning recipe during the YUMMY COOK-OFF last September 2007, and the appetizer to my AMERICAN set meal. You will need one pack mixed greens like lettuce, arugula, rocket and even raddichio. 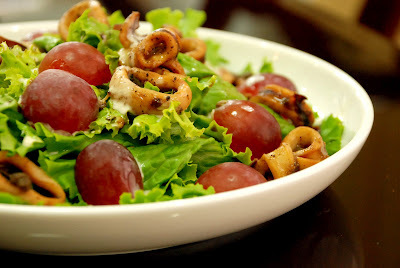 Seedless grapes, squid rings marinated with salt & pepper with kepap manis are also needed. Prepare mayonnaise then mix it with a little balsamic vinegar, milk, extra virgin olive oil, salt and pepper for the dressing then set aside. Prepare a huge salad bowl then arrange the mixed greens then top it with grapes then set aside. Heat med pan in high temperature with butter then saute the marinated squid for few minutes. When cooked, place it on top of your salad bowl and pour the right amount of dressing and serve. I saw you during the YUMMY cook off. Ito ba yung umaamoy sa buong Shangri-La? at sarap na sarap yung host na si Ruby Rodriguez? Must be the squid you are frying.